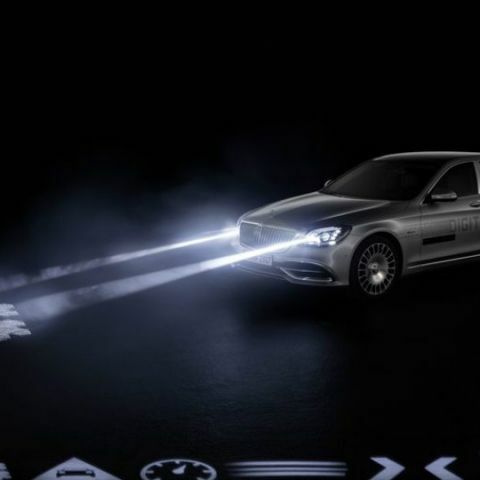 In future, Mercedes-Benz aims to make a car's headlamps multi-function as high definition and precise lighting units, which can also project symbols to ease driving or even aid ADAS systems. Mercedes-Benz has been dabbling in improving the future of mobility for a while now. As one of the oldest and most influential car brands globally, the German auto giant has brought forth some of the most relevant concepts for the future. The latest venture - Mercedes Digital Light, is one that will possibly remain relevant in future, while being a novel addition to cars at present. 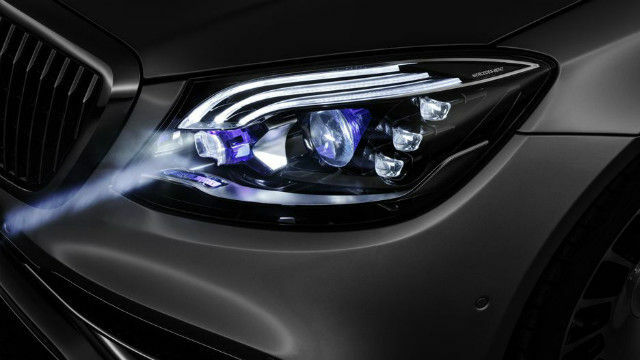 Mercedes Digital Light converts the digital LED headlamps into multifunctioning hubs. The high definition headlamps are computer-controlled, and the technology in itself allows the headlamps to project a range of symbols ahead on the road. This, Mercedes aims, will prove beneficial for both the driver and his surroundings. 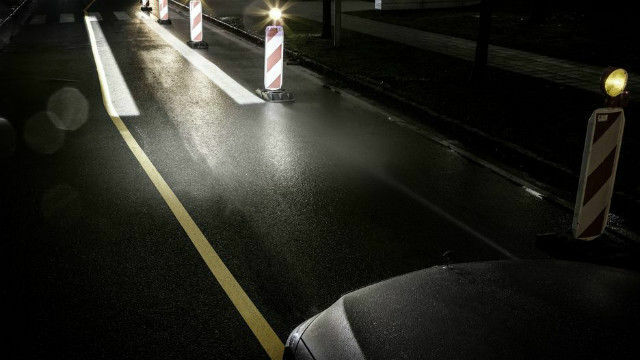 To begin with, the lights are dazzle-free, and an automatic beam adjuster synchronises with the proximity sensors to identify approaching cars and pedestrians. 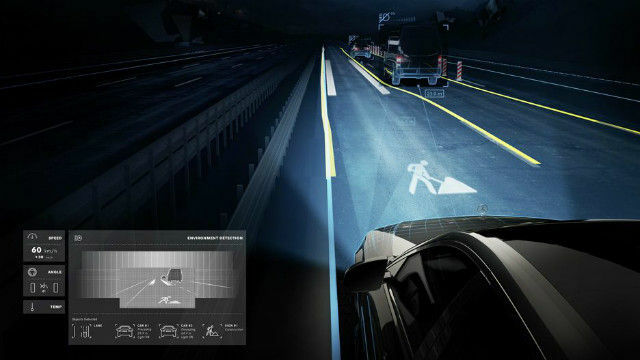 Simultaneously, it adjusts the glare of the headlamps such that the approaching person or car does not get dazzled by the light from the LEDs. This is particularly important for road safety at night, and even more so on highways. The system is automatically activated at speeds above 54kmph. Each headlight features a computer-controlled chip, with over one million micro-reflectors on its surface. 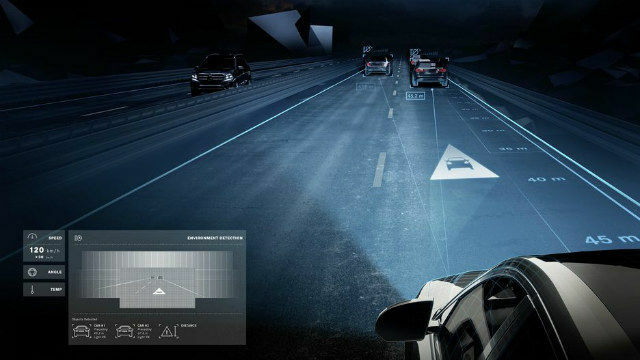 These reflectors are controllable by the central computer onboard the car, which in turn take in information from the array of cameras and sensors to facilitate systems like the Mercedes Nightview Assist Plus. Being fully controllable, the micro-reflectors can adjust themselves to project a wide range of symbols on the road ahead, while on the move. It is this that makes Mercedes Digital Light a crucial ADAS system that works differently from in-car assistive technologies. 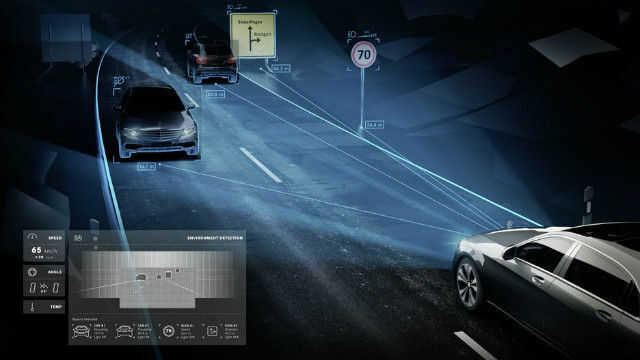 Digital Light helps make the environment around a car equipped with this technology about road conditions, proximities and obstacles, thereby functioning as something between a more versatile Head-Up Display and a surrogate collision avoidance unit for cars and pedestrians nearby. The range of symbols are pretty vast, and can be used to project a range of information. 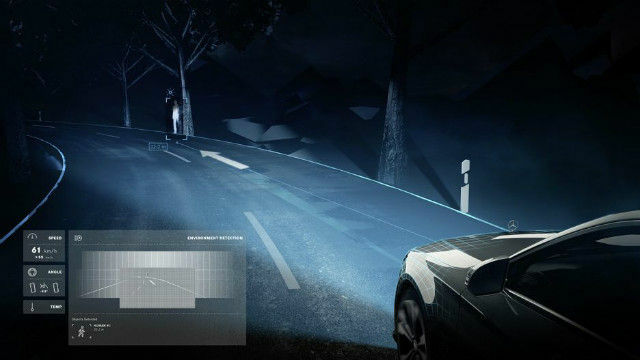 For instance, on a dark road, Digital Light can scan the road and project guide rails for a driver to follow along a narrow path. Additionally, a wide range of high definition symbols can be projected on the road ahead to alert the driver as well as cars that are around. Driver-centric signals by Digital Light include lane projection (as elaborated above), proximity warning to car ahead via Mercedes Distronic system, lane-keeping indication, blind spot warning (activated when turn indicators are switched on), speed warning via Traffic Sign Assist, roadwork alert and pedestrian detection arrows. A number of these symbols also work for both the surrounding individuals and the driver alike. For instance, the blind spot warning, roadworks alert and pedestrian detection alerts are beneficial for both parties. 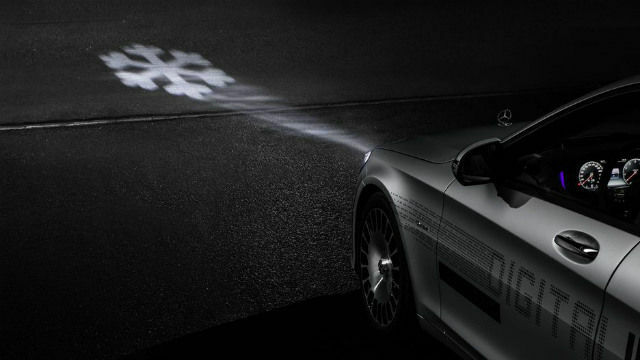 Mercedes Digital Light can also adjust its beam to be more spread out and be narrowed down as necessary. This helps drivers detect obstacles and road signs even when driving in darkness. All of this allows the car to use its non-fatigue, high definition headlamps to a greater potential, where it contributes to road safety in more ways than one. 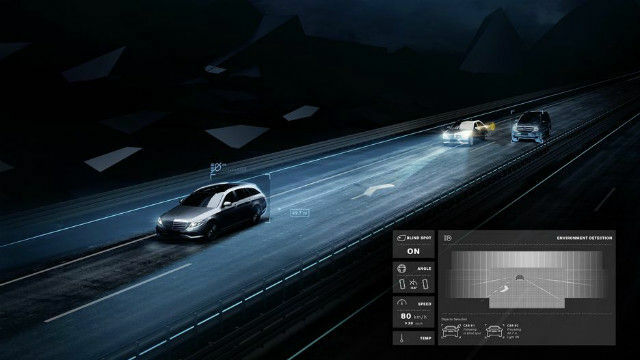 The Mercedes Digital Light system also synchronises with the car’s weather detection system to identify road conditions. For instance, if it is snowing, a low road grip symbol is projected to alert everyone about the slippery road surfaces. 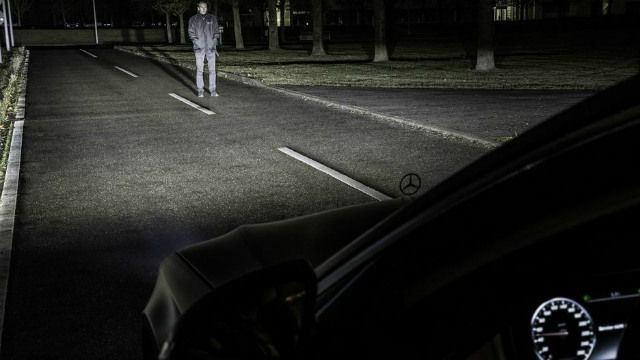 The pedestrian detection arrows, however, can be fairly spooky if you're cruising along a deserted road at midnight and you suddenly spot an arrow pointing at a hidden figure standing ahead in the shadows. The best bit about this system is the versatile projection system, to which more symbols can be installed via over-the-air updates to the in-car infotainment unit. However, while the technology is widely impressive, it is also rather expensive to build, which is why it premieres only on the top variant of the Mercedes-Maybach lineup. What is Digital Recording ?